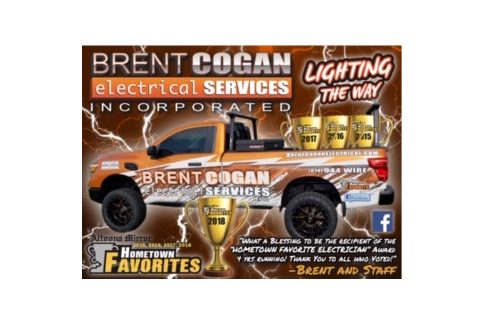 As a Member of the Blair Bedford Builders Association and Better Business Bureau, Brent Cogan Electrical Services, Inc. was voted "Hometown Favorite Electrician" by readers of the Altoona Mirror in 2011, 2015, 2016, 207, and again 2018! We continue to 'Shine' as the local Electrical Company in Duncansville that provides both Homes and Businesses in Blair County and the surrounding area with an inspiring array of Specialized Lighting & Electrical Services. This not only includes New Construction, Build-outs, Fusebox Upgrades & Rewires but also your everyday Repair Services, Routine Electrical Maintenance, Back-up Generators, Pole Lighting, Pools/Spas, Landscape Lighting and Telecommunications.